Using the Subaru Telescope atop Maunakea, researchers have identified 11 dwarf galaxies and two star-containing halos in the outer region of a large spiral galaxy 25 million light-years away from Earth. The findings, published in The Astrophysical Journal, provide new insight into how these 'tidal stellar streams' form around galaxies. 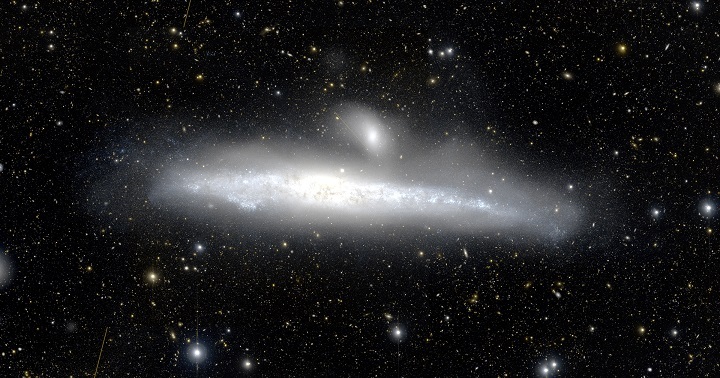 Based on calculations aiming to estimate the metallic content of the stellar streams, the team believes it's possible that they originated as a result of a gravitational interaction between the Whale Galaxy and a dwarf galaxy orbiting it.The team focused their attention on Galaxy NGC 4631, otherwise known as the Whale Galaxy because of its shape. They identified 11 dwarf galaxies in its outer region, some of which were already known. Dwarf galaxies are not easily detected because of their small sizes, masses and low brightness. The team also found two tidal stellar streams orbiting the galaxy: one, called Stream SE, is located in front of it and the other, called Stream NW, is nestled behind it. It is thought that stellar halos are less common when a galaxy's total stellar mass is smaller than the stellar mass of larger galaxies, such as the Triangulum Galaxy. As a result of their calculations, the researchers believe that the Whale Galaxy, although large, has a smaller mass than the Milky Way. Nonetheless, it is still in an active growth phase, and so are its surrounding halos. Future studies could help further clarify how stellar halos form around galaxies with relatively small masses, the researchers conclude. This research is published in the Astrophysical Journal (Tanaka et al. 2017, "Resolved Stellar Streams around NGC 4631 from a Subaru/Hyper Suprime-Cam Survey", The Astrophysical Journal, 842, 127).